Reid Health is a lead sponsor of the SUNshine 5K on Sept. 15 in Greenville Park. Pictured (left to right) are Christy Prakel, executive director of the Darke County Foundation; Henry Chong, MD, of Reid Health’s Bethel Cardiology; and Maria Muhlenkamp, NP, of Reid Health’s Bethel Cardiology. 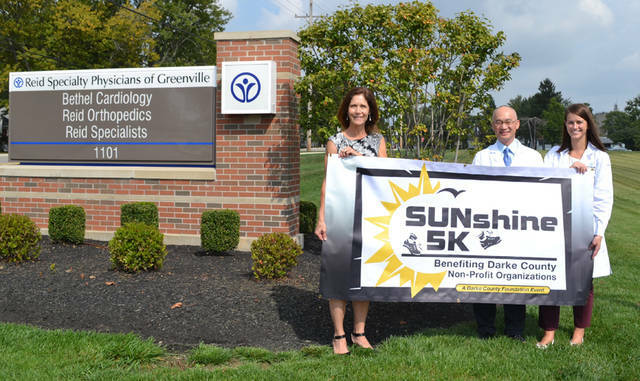 GREENVILLE – Community members are invited to come out to Greenville City Park at 8:30 a.m. Sept. 15 for the annual SUNshine 5K Run/Walk, hosted by the Darke County Foundation. Reid Health is the lead sponsor of the event. Participants may register at www.darkecountyfoundation.org. Early entry fee is $18 (age 15 and older) and $15 (age 14 and younger) until Sept. 6. Fee includes long-sleeve tech T-shirt. After Sept. 6, entry fee is $25 (limited shirts available) or $5 for age 14 and younger (no shirt). A free kids 800-meter fun run is at 8:15 a.m. Runners and walkers will enjoy a scenic route with age-group awards, valuable door prizes and a variety of homemade cookies, snacks and drinks. Free childcare is available. Proceeds from the SUNshine 5K will benefit these local non-profit organizations: AddieGirl for Cancer Association of Darke County, Ansonia High School National Honor Society, Big Brothers/Big Sisters of Shelby & Darke County, DeColores Montessori School, Edison Foundation and St. Mary’s School. Reid Health, headquartered in Richmond, Indiana, has a Greenville facility at 1101 Jackson St. The 34,000-square-foot complex houses Bethel Cardiology, Reid Orthopedics and other specialties offered by the Reid Health system. The SUNshine 5K is part of the Darke County Wellness Challenge. For more information, call 548-4673 or e-mail dcf@darkecountyfoundation.org.